Classrooms and conference rooms requiring image sizes up to 115" diagonal and ultra short throw that allows teachers and presenters to stand at the screen without casting shadows onto the image. 24/7 operation. Displays and signs, allowing a large image in tight spaces and needing little extra room behind the screen when using rear projection to hide the projector. a camera next to the projection lens. Physical attributes. All connectors are on the front, facing the screen and hidden from view. 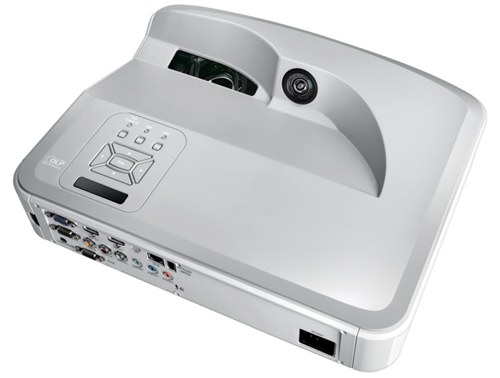 With the projector on a table, and viewed from the front, most connectors are on the left half of the panel. The exception is the power connector on the right side. The Kensington lock slot is near the bottom of the front. about half-way between left and right sides. As viewed from the front also, intake vents cover most of the left side, exhaust vents cover most of the right side, and the security bar is on the bottom, near the left side. Low Brightness (Eco) Mode. Eco mode lowers brightness by about 37% compared with Normal mode. Presentation Optimized Lumens. The default settings for Bright mode offer the ZW300UST's full 3540-lumen brightness with nicely saturated color for graphics and documents. As with most projectors brightest modes, it has a slight green bias. But in this case the bias is subtle and not so much as to make skin tones unnatural. That's enough to make it the Presentation Optimized setting even for presentations that include photorealistic images. Video Optimized Lumens. For film and video, Movie mode without changes is our Video Optimized setting. Game mode, with its slightly higher brightness, comes in a close second. Most memory colors in photorealistic images are within the realm of acceptable for both modes, but Movie mode stayed within that range with more clips in our tests. Keep in mind, however, that the ZW300UST is designed primarily for graphics and documents in an ambient light presentation setting, which means it favors brightness over color accuracy. Brightness Uniformity. The 57% brightness uniformity is a greater difference than typical even for an ultra short throw model, but still not enough to be an issue for most purposes. It is apparent with a solid white image, and you can see it if you look for it with text, graphics, or photorealistic images that break up the field of view. However, most people are unlikely to notice the unevenness in illumination with most images and will quickly accommodate to it if they do notice it. Input lag. The input lag is 33 ms in all color modes. Throw distance. As is typical for ultra short throw models, the ZW300UST's lens system uses a mirror as the final element to reflect the image through a window near the back of the projector. The distance from the front of the projector to the window is roughly 9 inches, which puts the front edge anywhere from about 10.4" from the screen for an 85" diagonal 16:10 image to 18" for a 115" image. Both closer and farther out distances from the screen tend to create focus problems. Mounting and lens offset. At just 12.3 pounds and 5" x 15" x 12.5" (HWD), the ZW300UST is small and light for an ultra short throw model. However, the size and weight is more about helping make permanent installation easy than about portability. Getting the image squared off and the focus just right is tricky with any ultra short throw projector. Thus it is best to set the projector up permanently once, rather that set it up repeatedly as a portable or cart-mounted unit. The ultra short throw makes the ZW300UST suitable for either a wall mount above the screen or a flat surface just in front of and below the screen. Support for 360-degree orientation in any axis allows more creative placement for displays and signs as well, including those that use edge blending software to create larger images with multiple projectors. 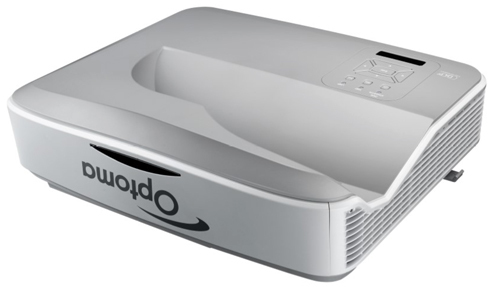 At $1,799 street, the 1280x800 Optoma ZW300UST is the least expensive laser-phosphor based, ultra short throw projector on the market today by far, making it an outstanding value. It's also the smallest and lightest, which helps make it easy to set up. The rated 3,200 ANSI lumens, with a higher measured brightness, is spot on for small to medium-size classrooms and conference rooms. The ultra short throw lets you place the projector just under or just above the screen, eliminating long throw distance issues and allowing teachers or presenters to interact with the image without casting shadows. And if you need an interactive model, all this applies to the interactive Optoma ZW300USTi as well. With a maximum 115" diagonal 16:10 image, the ZW300UST is a light canon for the image size. 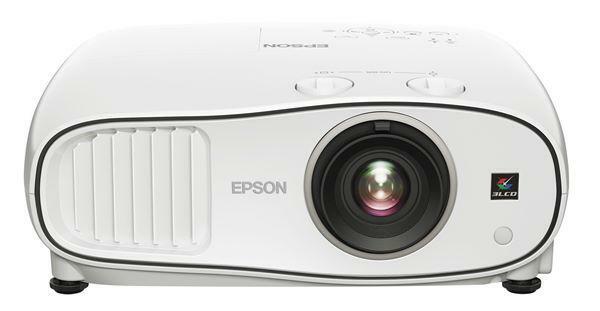 In moderate ambient light, 2100 lumens would be enough for the 115" image. Every color mode meets or exceeds that threshold in Normal power mode. Bright color mode--our Presentation Optimized setting--meets it even in Eco mode, at a measured 2241 lumens. The design and color wheel favors brightness over color accuracy, but colors are suitably eye-catching for graphics, and acceptable for the vast majority of photorealistic images. As with any model that supports 20,000 hours of virtually maintenance-free, 24/7 operation, the option to set it and forget it is always welcome. But it is also a key benefit if you want to use the ZW300UST for displays, signs, or the like. The ultra short throw adds the advantage of letting you use rear projection to hide it behind a screen easily. And the support for mounting in any orientation lets you use it in more creative displays as well. For multi-projector displays, simply add edge-blending software. The Optoma ZW300UST is unique at this writing at anything close to its price. It is one of about a half-dozen 1280x800 models with 20,000-hour laser-phosphor light sources and comparable ultra short throws. But it is $800 less than anything else in that small group except for the Optoma ZW300USTi. Add in support for 24/7, nearly maintenance-free operation and 360-degree orientation, as well as a measured brightness at 110% of the rating, and the Optoma ZW300UST easily earns our Road Test Certified award for delivering outstanding value.